Brazil is South America’s giant, covering a large landmass and encompassing many diverse regions. Brazil is a seductive country, with dazzling beaches, tropical islands, deep canyons, waterfalls, picturesque towns - and amazing horse riding holidays! The landscapes are as diverse as the people who inhabit it! 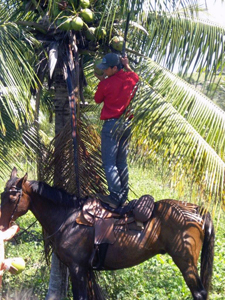 Hidden Trails has four excellent horseback vacations available in Brazil – each with its own unique appeal. Both horseback trips offer superb wildlife spotting opportunities, in ecological wonder lands, making them excellent horseback tours. Near Sao Paulo - the Plantationa Ride offers riding in the highlands that takes you through the coffee-growing region of the northeast of the State of Sao Paulo, visiting some of the great historic plantation homes, and passing through the surprisingly well-preserved natural wealth of the region. On the Darwin's Rainforest Trail you can horseback ride on mysterious, narrow tracks through the beautiful Atlantic rainforest, so rich in reptiles, amphibians, butterflies galore and exquisite orchids. It is time to hit the beaches of Brazil with the Bahia Beach Ride! On this horseback vacation, stay away from the tourist beaches - this is where the locals go to languish in the sunshine! With golden sands and emerald seas, Trancoso is a village of incredible natural beauty! When traveling through Brazil, you see horses everywhere. According to the Brazilian Geography and Statistics Institute – IBGE, there are nearly 6 million horses in the country, which means Brazil has the fourth largest herd in the world. Many of these horses are of mixed origin and often used in cattle-ranching. But Brazilians also breed and enjoy riding quality horses in disciplines that range from classical dressage to trails ride.There are over 340.000 Quarter Horses, more than 35.000 Arabs, around 27.000 Appaloosas and 13.000 Lusitanos. Apart from those international breeds Brazil also values its national breeds: the Mangalarga Marchador with over 350.000 horses, the Criollos with over 260.000 horses(the same breed you find in Argentina, Chile and Uruguay) and others like the Campolina with around 45.000 horses and the Brazilian Sports Horse with almost 10.000 horses. The Brazilians Mangalarga are doing very well in some countries of Europe (with over 900 registered horses) and in the USA. Bahia Beach Ride – Trancoso/CaraivaA ride through marvelous beaches, Indian and small fishing communities and preserved rainforest.While Brazil is known throughout the world for Rio de Janeiro, its lively beaches and the excitement of Carnival, native Brazilians hold on to their best kept secret: the golden sands and emerald seas of Trancoso in Bahia.